Feeling anxious and distracted? Has 'autopilot' become your default setting? Join us for this 1.5-hour VETgirl online veterinary webinar with Jeannine Moga, MA, MSW, LCSW, where we will learn practical, in-the-moment tips for tuning out the static and tuning into the present moment. Mindfulness is not just a trendy catch phrase - it is a powerful tool that can improve our emotional, cognitive, and physical wellbeing. Learn how to harness your brain's inherent capacity for focus and flow in order to minimize overwhelm, tamp down the inner critic, and maximize productivity, connection, and satisfaction. Having trouble enrolling in July 15, 2018: Brain Re-Training: Everyday Mindfulness Practices to Enhance Your Life at Work and at Home. Don’t see any opportunity to register. Please count me in. Please confirm. Hi! 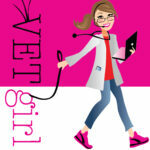 You have to make sure you’re logged in as a VETgirl ELITE member and click the button below to register. We’ll email you now! How can I register for Retrain your Brain if not an elite member? Info on webinar states I can pay $50. There is a button on the website to purchase a single viewing if not a member.